Internationally acclaimed designer Benjamin Hubert founded his eponymous studio in 2009 in North East London. After Graduating from Industrial Design and Technology at Loughborough University, Benjamin worked for several design consultancies prior to establishing his own studio. The studio works to the ideals of ‘Materials Driven. Process Led. Industrial Design’ focusing on the research of construction, context and application of new materials, across a broad range of sectors including furniture, lighting, consumer goods, architectural installations and art direction. More info & purchase here. The Chimney lights are produced using a technique known as slip-casting (liquid clay poured into plaster moulds) - they are cast with a white earthenware clay. After casting they are hand painted with a terracotta slip which has an addition of 25% sand - the painting process takes place on a potter's wheel. They are then glazed on the inside with a white tin glaze and kiln fired. 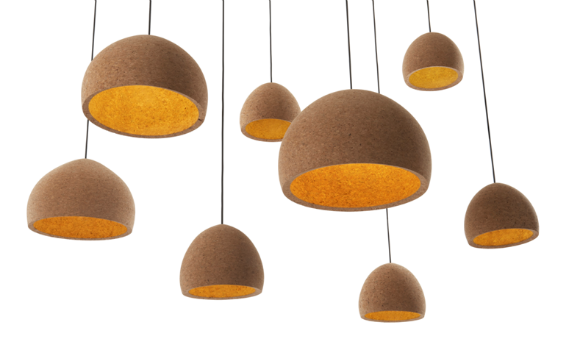 Float pendant lights are manufactured in a Portuguese factory, hand turned using traditional wood working techniques from large agglomerate cork blocks. The blocks are environmentally friendly as they are constructed from the waste product in wine stopper manufacture. Turning the cork blocks produces a high volume of waste, however due to the recyclable nature of the cork, it is put directly back into the process to make new lamps. 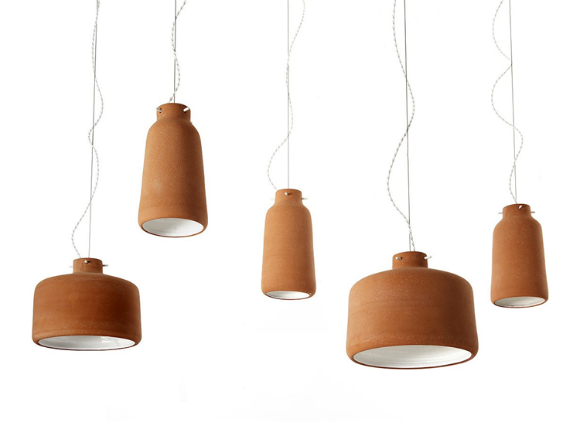 The lamps retain a classic simplicity, allowing the focus to remain with the cork material. When illuminated the reflected light within the shade produces a warming natural glow emphasised by the colouration of the cork. Available in 2 sizes & 3 colors. Spinning Lights are inspired by the process of metal spinning and intend to emphasise this technique, utilising aesthetic references to toy spinning tops. The lamps consist of a lacquered spun aluminium shade, counterbalanced with an injection moulded PVC fitting to extend the transition between shade and cable. Spun aluminium with gloss lacquered exterior finish. The pieces aim to resemble spinning-top toys. 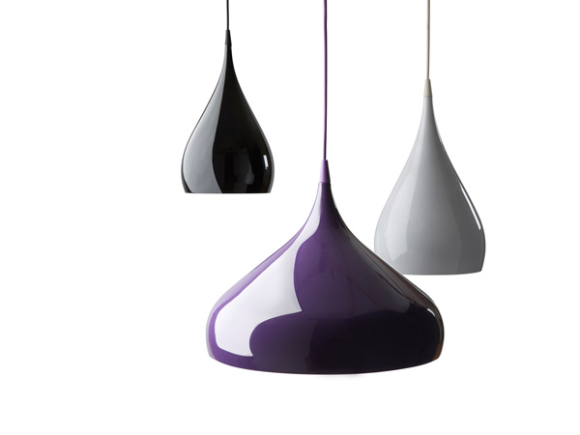 The lacquered finish is available in black, white and purple. Available in 3 sizes (S, M & L) & 3 colors. Heavy Light encapsulates a material focused approach to the design process, a signature of Benjamin Hubert’s work. As one of his first collaborations, Heavy Light was designed to push the potential of what is typically an industrial material, as well as challenge perceptions of inherent value. Developed in close collaboration with a specialist producer in East Germany, it is illustrative of the perfect balance between innovative manufacture and visual simplicity. 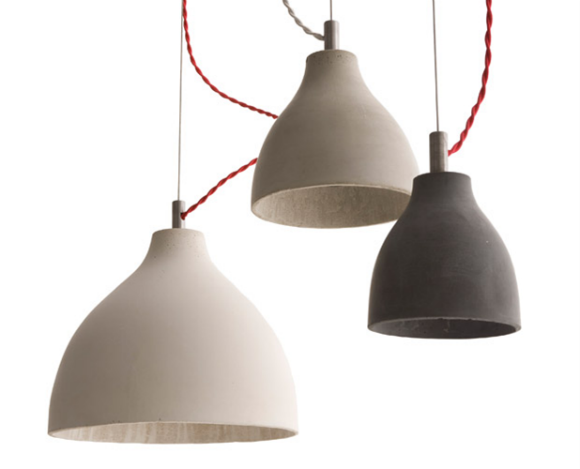 Shade available in white, light grey or dark grey cast-concrete. Fittings in either Red braided cable with brushed steel ceiling rose or white braided cable with white ceiling rose. Benjamin Hubert has received international critical and media acclaim and has been exhibited internationally. The studio has also received a number of prestigious awards including: Design of the year (British Design awards 2010) Best Product (100% design/Blueprint awards 2009) Homes and Gardens Young Designer of the Year (Design Classic Awards 2010) EDIDA International Young Designer of the Year 2010, the A+W Audi Mentorpreis 2012 and the winning commission for Poltrona Frau Centenary armchair.